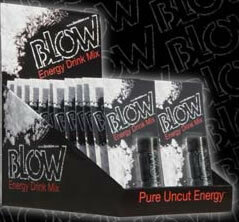 Blow is a powdered energy drink mix. The white powder is contained in a vial. Each vial contains 5.75 grams (which should be added to an 8 ounce drink). Blow is courting controversy by using the name of an illegal street drug. Blow is sweetened with Aspartame and Ace-k.
“Edgy” means marketing the vial of caffeine as a party drug, along with media promotions showing images of slutty women and pervy men. Not really edgy; the illicit drug thing has been done before – and as for the scantily clad ladies – well that’s as old as advertising itself. Blow packs a punch: 240mg caffeine and 2000mg of Taurine. The associations between good ole humble caffeine and hard drugs are a little disturbing. Someone somewhere is seriously going to start getting the wrong idea and wreck it for all the rest of us. Taurine (2000mg), Citric Acid, Natural Flavor, Caffeine (240mg), L-Carnitine (140mg), Aspartame, Tricalcium Phosphate, Inositol (140mg), Acesulfame Potassium, Kola Nut Extract (50mg), Vitamin B3, B5, B6, B12. How Does Blow Energy Drink Mix Compare? Blow Energy Drink Mix contains 30.00 mgs of caffeine per fluid ounce (101.44mg/100 ml).